A Leading Utility service provider wanted to deploy a .NET application and Oracle 12c on private data center, to overcome challenges involving security, latency & performance. As Oracle Database 12c is a cloud version and can only be deployed as a cloud database; Azure Stack was the best option. 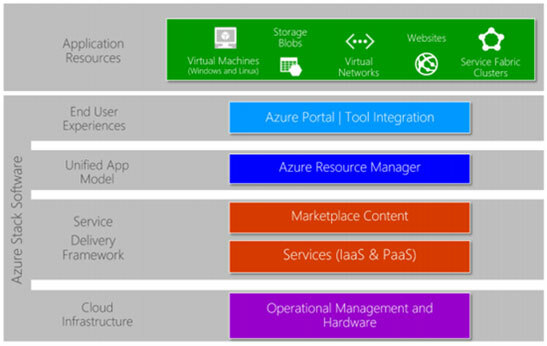 The below image provides a simplified view of the Azure Stack Product Architecture. Your own piece of public Azure in a box, with dedicated performance and security under your control. Ability to purchase Azure Stack-as-a-Service (Capex vs Opex) with predictable monthly costs based on usage. Ability to choose for a dedicated Azure Stack infrastructure, your own secure Azure environment without any other tenants. The network is local to you, no fee for network traffic, low latency, great performance. Use Express Route (after GA) for a dedicated high-performance and secure connection to Azure, traffic doesn’t go through the Internet. Hyper-Scale to Azure when you need more capacity in case of an event. Only pay for the resources used, no capital costs. Cross premises and stack to stack connectivity with site-to-site VPN.